Easy raised bed kits. Hundreds of shapes and sizes! Easy assembly—just stack boards and insert corner pins. Raised bed gardening offers many benefits such as improved soil, higher yields, ease of access, longer growing seasons, and better pest control. Raised beds can be set up almost anywhere—regardless of soil conditions and with less effort than digging—to produce more vegetables per square foot, which makes them the perfect solution for urban gardening. We have designed a kit to make building a raised bed as easy as possible. Just level ground, stack boards, and insert corner pins to make a long-lasting planter for your flowers and vegetables. No tools necessary. Assembly takes just minutes! Easy assembly—just stack boards and insert corner pins. Build raised bed gardens in endless shapes and sizes. Trim packs and bottoms are available for any size bed. Unlike most planters, the simple design of our kits allows wood to shrink and swell for improved durability in wet conditions. Hardware such as screws and nails eventually loosen as wood ages. 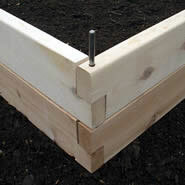 Our raised beds assemble with rust-free metal pins set securely through the ends of each board. So after years of exposure, the planter won't fall apart, and yet can be disassembled by hand if needed. Raised garden beds are made from long-lasting cedar protected by a non-toxic waterproof sealant that is safe for vegetable gardens. Raised beds are covered by a 30 day satisfaction guarantee and 10 year limited warranty. Available for any size raised bed. Square and rectangle raised beds are popular and easy to set up in traditional row gardens. Hexagon and octagon raised beds offer eye-catching shapes and easy pathways for wheelbarrow and wheelchair access. L-shaped raised beds work well in the corner of yards, or to enclose and divide open spaces. U-shaped raised beds provide great accessibility and efficient use of growing spaces. 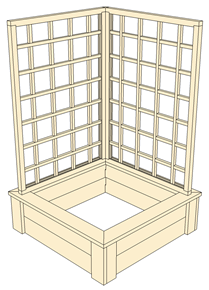 Trim pack and planter bottom options are available for any size raised bed, in addition to a variety of matching garden trellises. Raised beds come in many shapes to fit every size garden—select a shape below to get started! "Searched hi & low – by far the best item at best price! Love it!" "Great product, fast shipping, excellent communication. Thank you!"